This is no ordinary penalty shootout, and it's not only the result that counts. The phrase "winning isn't everything" has never been more true. In this game, everything counts from the shirt number of the goal scorer to the area of the goal he scores in. 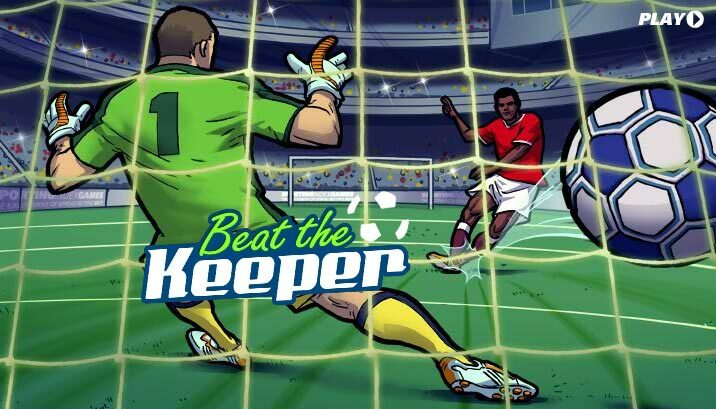 With 10 markets to bet on you can choose between Brazil, England, Germany, USA and Mexico and then watch them battle it out against a neutral penalty saving expert. The first thing to do is choose whether you want to play a 'quick' game or a longer 'in-play' game. When you've made that decision it's on to which team you want to play with and against. In total there are five teams of varying ability to choose from – Brazil best and Mexico the worst (click 'Teams' in the top right corner to see percentage scoring chance and individual player stats for each team – updated every time you log-in). Note that each team has five players, wearing the numbers, 4, 6, 9, 13 and 18. They will always take penalties in that order. Every area of the goal has a points value attached to it, as shown below. Each team has it's own probalities for hitting each area of the goal. The teams with more abillity have a greater likelihood of hitting the higher goal point values. See the probability grids for each team within the in-game help section (top right). If you are playing an 'in-play' game, you have 30 seconds between each kick with which to place a bet. If you do not confirm your bet within this time it will be considered a 'skipped' bet and the game will continue on to the next kick.